Crescent Growth CApital (“CGC”) and the Las Vegas-Clark County Library District (“LVCCLD”) are pleased to announce the closing of a $10M NMTC financing, using allocation provided by the Clearinghouse CDFI, and a NMTC equity investment provided by Chase Bank. This new library project is one of LVCCLD’s new model libraries, aimed at providing a broad swath of community services and bringing the library into the 21st century. The new 16,000 sf Mesquite Branch Library of the Las Vegas-Clark County Library District lies in the heart of the rural community of Mesquite, population 17,059, located in Clark County, an 8,000 square mile county in southern Nevada. The community is 82 miles from Las Vegas NV, 20 miles from the Arizona border, 40 miles St. George UT, and 35 miles from the Paiute Reservation in Moapa, NV. Mesquite serves as a regional center for many functions. Children from nearby Arizona towns attend Mesquite’s Clark County School District schools. Mesquite has been designated a priority need area for city, state and regional economic development and workforce agencies. The library site is located on the only CDBG block in Mesquite. 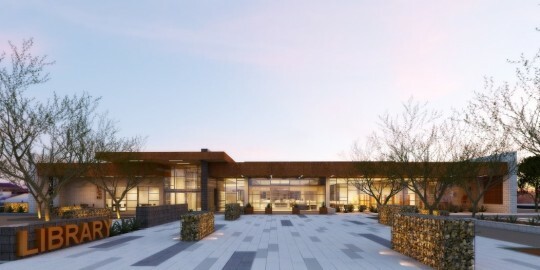 The site is located within the City of Mesquite-designated Enterprise Zone and is in a rural area identified by Workforce Connections, the southern Nevada agency for employment, business and career support, as high need/low resource. Workforce Connections has provided a full-time onsite staff person to start-up and expand employment, business and career development services to scale when the new facility comes on line. Plans are now in progress to combine federal education, labor and library resources to conduct specific job training and OneStop services from this facility, along with English language instruction and citizenship. Workforce Connections will provide staff, instruction and career coach expertise. The Library District will provide public access computers, laptops, Internet, Wifi, printers, scanners, copiers, and other office equipment, as well as a wealth of physical and virtual materials, information sources, databases and apps that support economic development and education. Once complete, the project will give the public access to a new community meeting room, consultation and study rooms with monitors, computer and instruction labs, and access to physical materials and virtual resources that ultimately make this library facility a community hub for economic, education and social well-being. In this way, this project will prototype a new library model that combines free public access to technology and services for learning, training, making, entertaining, and gathering. It will also prototype a new kind of intergovernmental collaboration. As indicated above, the facility will integrate local, county, regional and state services for workforce, education, social services, citizenship, and libraries. Services provided free to the public here will support OneStop workforce services; small business development support; social service and government agency connections; early childhood development; parent engagement; student support such as homework help; English language, High School Equivalency, and literacy instruction; public computer, Internet and Wifi access; community and cultural events; and job training and certification programs related to the early childhood education sector. This project will create an estimated 7 positions, while retaining another 15 existing positions. Full-time Mesquite library employees will receive a full set of benefits, including health insurance and retirement (Nevada PERS), which is valued at roughly 30% of salary. Full- and part-time employees are covered by Worker’s Comp.